Data security for cloud applications is a perennial challenge due to the lost of control and oversight over data placed within clouds. As cloud becomes mainstream, various industries need to comply with an increasing number of regulations and stipulations for its cloud application portfolio. 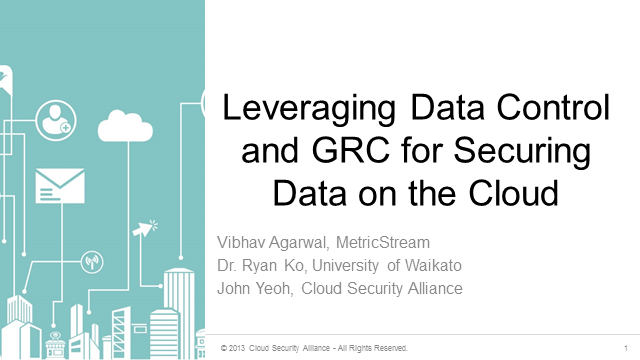 To manage these evolving challenges, we need to (1) address immediate challenges with a defensive, in-depth and resilient Cloud security strategy based on a robust Governance, Risk and Compliance (GRC) framework and (2) address long-term challenges via researching on the returning control of data to users. This will not only enable enterprises to step forward and leverage cloud in a more standardized manner, but also reduce their dependancies on third parties involved – assuring a high level and sustained assurance over data security. · CSA's role in STRATUS and contributions to its data governance and accountability project. · Some demos and future directions of the STRATUS project.